To understand Joomla tepmlate development tuttorial a decent understanding of HTML, xHTML, CSS, XML and PHP is needed. The template files are installed inside the templates folder of every single joomla installation. The template must have a specific name and all the necessary files and folders of the template will be located inside the folder. If you analyze the code you can understand that it is almost a simple HTML template with some joomla specific PHP code embaded. It’s a very basic layout, but it will do the job. Everything else will be done by Joomla. These lines, usually called jdoc statements, tell Joomla to include output from certain parts of the Joomla system. In this templateDetails.xml file you need to include all information about the template which will be carried as xml data. This part of code is needed for xhtml validation for joomla 2.5 and 3.x series. In the extension tag part is description about joomla version, author and files and folder names are included. Positions tag indicates the templates module positions. Now save all the files showed in this tutorial and put them inside w3p folder or youe desierd template folder. 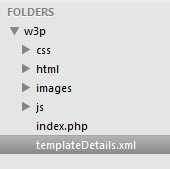 Now zip the file as w3p.zip and install it in your local joomla installation from extension manager and check the changes. So you have got the basic idea about joomla 3.x template structure in this post. In the next post I will show a full fledged joomla 3.x template with twitter bootstrap. Open source technology enthusiast & passionate programmer. PHP based Web developer. Fan boy of twitter Bootstrap, jQuery, Backbone.js, Joomla, PyroCMS & Laravel PHP framework. Also interested in Python, Django, C++, C#, Drupal, OpenCart, WordPress, Linux & Android. Love to play with new technologies.